Generally we tend to think of salads as something to serve cold, particularly on a sunny day. However in winter, salad vegetables can be scarce and/or over priced. So why not try our hot vegetable salad recipe which not only makes good use of the vegetables in season but is also able to be varied and served as a main meal or lunch all year round. We have based this dish on potatoes because they are cheap, highly nutritious and readily available. However these can be replaced with other starchy vegetables such as kumara, parsnip or yams. 800g waxy potatoes (e.g. Draga, Nadine, Frisia or new), peeled and chopped into chunks of about 3cm. Peel and chop the potatoes into large chunks and boil until cooked but firm. Microwave the green beans, chopped celery, spring onion and red pepper on high for 3-4 minutes until cooked but still firm. Drain the potatoes and combine with the other vegetables in a serving bowl. 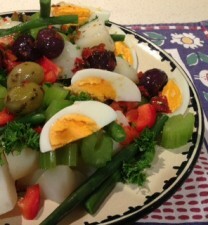 Arrange the olives and hard-boiled eggs on the top of the salad. Sprinkle over the parsley, lemon juice and dressing. Each serving contains: Energy 220 kcal /920 kJ; Protein 8g; Fat 4g; Carbohydrate 35g; Sodium 220mg; Dietary fibre 5g. Use other vegetables such as courgettes, baby corn, pumpkin or kumara, yams or broccoli. If served cold the next day leftovers can be extended by adding gherkins or chopped sun dried tomatoes. Note: These variations will increase the sodium and fat content too so if weight is an issue for you then keep an eye on your portions. ** Oil free dressings tend to be very low in energy but if body weight is not an issue for you then you can use any of your favourite vinaigrette dressings.